An Event Held in Commemoration of the 10th Anniversary of Akebono-McLaren Partnership｜News｜Akebono Brake Industry Co., Ltd.
Tokyo, Japan - (October 6, 2016) - Akebono Brake Industry held an internal event in commemoration of the 10th anniversary of the partnership in the supply of brake systems with the Formula 1 team of McLaren Racing Limited ("McLaren") on Tuesday, October 4, at the Akebono's Global Head Office. 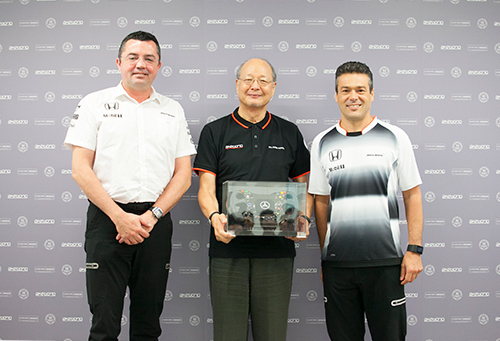 The event was attended by Hisataka Nobumoto, Chairman, President & CEO, and many other officers and employees from Akebono as well as six members from McLaren, including Eric Boullier, Race Director, John Cooper, Commercial & Financial Director, Stoffel Vandoorne, race driver for 2017 season, and Nobuharu Matsushita, development and test driver. "In the past ten years, we have learned a lot from McLaren in the improvement of our technical strengths and the development of our engineers. The technologies accumulated through our involvement in Formula 1 have been introduced into our high-performance brake business. Akebono has a history of challenge. We will keep on challenging. We will work together." Toshiyuki Negishi, Akebono's Managing Executive Officer in charge of high-performance brakes, delivered a presentation on the significance of the participation in Formula 1, a review of the technological development since the partnership was formed and the impact of Formula 1 technology on the development of brakes for high performance vehicles. From McLaren, Mr. Hiroshi Imai, Senior Engineer, gave a presentation on behalf of its development team with respect to advancement of Formula 1 technologies, the role of brakes, and the contribution of Akebono's brakes to the race team. In addition, in commemoration of the 10th anniversary of the partnership, McLaren presented the steering wheel actually used by Mr. Fernando Alonso Diaz in the Formula 1 Australian Grand Prix 2007, in which he got a podium finish as the first time since Akebono started supply braking systems. It was followed by an autograph session by two drivers. Thus, the event was concluded in slightly less than two hours. As an expert in brakes, Akebono embarked on Vision Creative Engineering Team (VCET) activities for pursuing the essence of brakes in 2002 in an attempt to supply its braking systems in the world of motorsports. First, Akebono became involved in downhill mountain bike (MTB) race. And then the company participated in motorcycle race, namely in the All Japan Road Race Championship since 2004, achieving a number of positive results, including series champions. In 2006, Akebono joined in Nurburgring 24 hours race as their first automobile race and achieved the magnificent result of second place overall. Next Akebono decided to challenge in Formula 1 as the top of the motorsports. It formed a partnership with McLaren as a leading team in Formula 1 races. Since 2007, Akebono has been continually offering braking systems to the team. In this way it has made significant contributions to McLaren team's 34 wins and 94 podium finishes in the past ten years. The involvement in Formula 1 has helped to dramatically boost Akebono's name recognition in the European market and technologies developed for the race have been used into its brakes for high-performance vehicles. Thus it contributes considerably to the expansion of the high performance brake business and recreating European operations, stated as one of the fundamental strategies in Akebono's medium-term business plan, akebono New Frontier 30 - 2016 (aNF30-2016).